Home blogger	FAN Trailer will force you to watch the MOVIE! 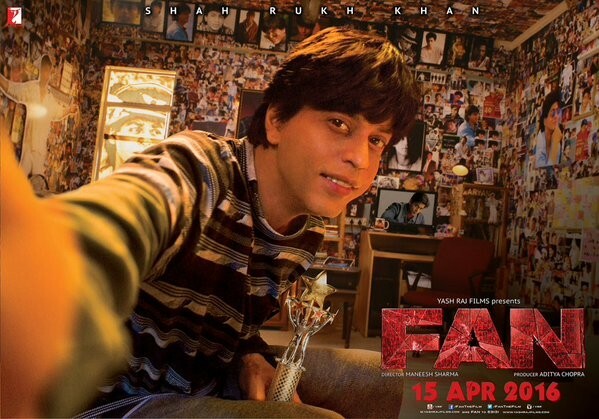 Finally, Shah Rukh Khan released the trailer of his upcoming movie FAN. Being a die-hard fan SRK, I could not resist myself in sharing this post with all of you guys. I had already watched the FAN ANTHEM almost thousand times and still can’t get over it. I’m so excited to watch this movie and I just can’t wait more for 15th April, 2016. Please come soon, you APRIL!! This movie is about an obsessive fan Gaurav (played by Shah Rukh) who is a fan at heart of a superstar, Aryan Khanna (also played by Shah Rukh). The trailer gives you goosebumps for the entire 2 minutes and 51 seconds. Well!! I’ll not say more because the trailer will hide all these words I’ve written here. You can thank me later ladies!! *wink* Let me know your thoughts about this trailer in the comments below. See you soon in theatres SRK!!! Is he repeating a thriller role like Darr? ?